These clever dogs usually live to eight years of age, but with plenty of care and fed the right amount of nutrition, German Shepherds can live up to ten or twelve years. 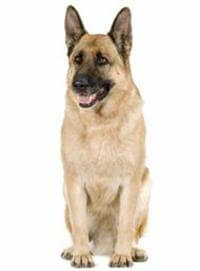 This is another large dog where a healthy female should weigh 25kg and stand 55cm tall while the male usually grows to about 40kg and is about 68cm tall. The German Shepherd does require attention. The breed is active and needs some mental stimulation, so a daily walk coupled with some thinking exercise, be it obedience training or a simple ‘fetch the ball’ routine will greatly enhance your dog’’s quality of life. Grooming on a weekly basis will suffice. Parents of this dog should be tested for Hip Dysplasia.